Are you sick of paying lots of money each year for professional personal finance software? Are you looking for a simple solution to your budgeting, accounting or personal financial software needs? If so, you should know that there are several free software programs available that can help you manage your money more efficiently. These programs may not get as much attention as Quicken or Microsoft Money, but they can still get the job done. These software companies often make money by having ads incorporated into their products or by cross selling other complimentary products. Also, they may not get as much engineering support as paid for online money management software because of the costs involved. With that said, they are free and are definitely worth testing to see if they meet your needs. GnuCash.org. 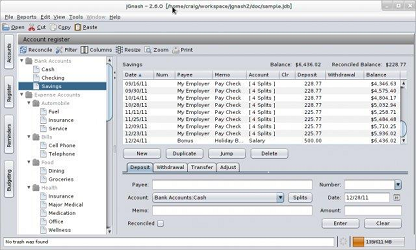 GnuCash provides free personal finance and small business financial accounting software that is licensed under the GNU license and is free to download and use. If you're looking to use this software for your personal finance needs it can be used to track and import your stock transactions, match them, and export them to your tax documents. It can also be used to track your bank accounts, which is an integral part of any budgeting process. 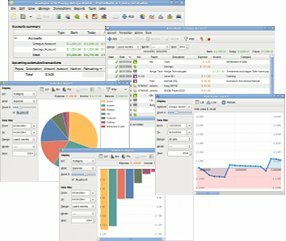 If you are using this software as a small business accounting software, it uses double entry accounting based on current accounting principles. And however, you use it, the program allows you to automatically create charts, reports and graphs of your accounts and financial situation. Furthermore, it is capable of making many complex financial calculations on your behalf. Buddi. Another free personal financial software package that offers both budgeting and personal finance functionality. Buddi software is designed for people with no financial background. It is designed to be as easy to use with simple assumptions and inputs. For this reason, it does not have as much functionality as the larger programs, however, it may be able to meet your needs. And, in our opinion, it is usually better to have a simple program that can meet your needs than a huge, complex program that is difficult to understand and does things you'll never need. Buddi is capable of helping you create your own personal budget. You simply add your accounts and information. It helps you create your budget, and then you can view reports of how your spending adds up. For example, you can see a pie chart with your expense breakdowns for each month. With this free software you can track your spending month by month to help analyze your spending and improve your budget. This program is also licensed under the GNU license that allows you to download and use it for free, as well as modify the files to your benefit (if you have the know how). HomeBank. This is another free personal finance software program that is mainly designed with basic home users in mind (versus small business and accounting users). It is registered under the GNU license so that anyone can download and use it completely free. Similar to other financial software, you can download your personal bank accounts into this program and classify each transaction into a category. The program also allows importing and exporting of QIF and QFX formats, so that it is compatible with other programs, in case you want to transfer your data from other software programs or export to other programs. The benefit of this software is that it is basic and easy to use. The downside is that it does not use double entry accounting. 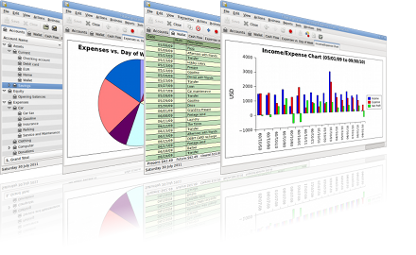 It is, however, geared at letting you analyze your expenses and create a rather detailed budget that can be viewed in graphical and report formats. Also, it appears that this software does not handle stock transactions, so if that is something that you need, you may want to choose one of the other software programs listed on this page. jGnash. This financial software is written in Java so it can work on any system that has Java installed. The software calls itself personal finance manager software. It appears to have a lot of functionallity, including double entry accounting, budgeting capabilities, QFX and QIF importing, report and graph generation that includes PDF reporting, and offers online updating of securities and currency exchange rates. The software has many other functions beyond these, and the interface is customizeable. Overall, this program seems like it is worth trying, especially if you need the extra functionality. It is capable of adding all of your accounts including bank, stocks, and business accounts. It also has auto completion of form fields to save you time and help with your transaction matching. As is true with all of the free financial software packages we list here, this software is free to download and use.